I consider it an honor to get to be thie first to say how stunning that is, inside and out. You know, I (very uncharacteristically) failed to look at the name of the poster before I read the post, but I had a feeling it was you when I saw the photos. Another maginificent loaf. Is that wheat bran or some other kind on the outside? The texture looks finer than the wheat bran I can get. I like it! Susan, you're so sweet to say that. Thanks. I used the bran that was sifted from my Hodgson Mill whole wheat graham flour. Before I got the Golden Buffalo I used to sift the HM graham because it was the only coarse WW flour I could find and the instructions for the Thom Leonard Country French are to sift out the bran to simulate high extraction flour if you can't buy it. I had a few little bags of the stuff from that so this was a great way to use it. Another note about this dough, I used a flour-sack towel and placed it over a large colander and sprinkled it with the bran. I then took this big, shaped lump of dough and turned it over that towel (just spread flat over the top of the colander) and it plopped right in. Then I dusted around the edges with a little more bran. After it was proofed it came right out like it was on teflon so it really worked well. That has the most beautiful crumb and crust!! I need a little education..is high gluten the same as high protein? It doesn't seem like it would be. How would I determine if a flour is high gluten? Would it be labled as such? Thanks, Paddyscake. This is the first time I've used the high gluten so I'm not all that familiar with it. It is a very strong bread flour with a higher protein level but that's probably a simplified answer. The only one I'm aware of is the Sir Lancelot that I purchased from King Arthur. I'd like to have more sources too as I don't believe I can find it locally. It was great flour to work with. Paddyscake, high gluten flour is a 12-14% protein bread flour, I believe often marketed as bread machine flour if you can find that anywhere. It's not the same as vital wheat gluten or gluten flour, which has 45+% protein. Zolablue, masterful as usual. Just how big was that loaf? And what did you think of the texture? I'm always reluctant to add higher gluten flours because I don't want a chewy crumb. But what a beauty, it does look perfect. Okay, you and Bart have conviced me. Dan owes you two a commission. browndog, funny you should say that just when I finally thought to myself.."you gotta get that book" after reading the above posts. I've been dragging my feet on this one because I worry about the errors mentioned elsewhere. I should learn to fact-check first...anyway, Paddyscake, a little research tells me that hi-gluten is in the range of 13-14+% protein, and 12% would be a strong bread flour but not considered high gluten. Well, weavershouse, I had decided to wait for a second printing but now my mind is changed so we can live dangerously together, huh? I didn't weigh mine but Leader says it is 45.5 ounces/1291 grams. It was a wonderful texture and surprisingly light for such a large loaf. Very springy when you try to cut it which is partly what helped make it messy with the bran sprinkled on top and so large across. Also, Leader didn't specify to slash it but if you look at the photo in the book it looks like it has been slightly slashed so that's what I did since it wasn't clear. I do hope he corrects some of the questions we have about his book. Great Job. I am wondering, with all these pictures appearing, corresponding to recipes in books, whether there would be a way for Floyd to set something up where we can lookup something by Recipe and then find the recipe and a list of everybody's photos of that bread. It would provide a wonderful balance to the "book" pictures, which are nearly always perfect, but perhaps not always believable. "Our" pictures are a more realistic representation of what is possible for TFL-ers. As it is right now, you can in theory find all this information, but you may end up looking through multiple posts and multiple comments. It can be tedious. On a related note to Floyd: If you could enable to use of tables in postings it would be a whole lot easier to publish recipes in a readable format. Thanks, dolf! (Oh, Floyd will love you suggesting all that! :o) I think one reason some of us started creating blog threads is because that is one way to organize posts under a user and kind of keep things more organized in that way. I try to add as many pertinent terms as possible in creating the thread so it might help in searching which I do think helps a lot. I'm never disappointed when I get an email about a "new blog posting" from Zolablue. This recipe is one of the reasons I bought Local Breads. I was hoping to build some of the big country loaves that were mentioned somewhere in a review of this book. I want to try the full-sized version in the brick oven, if I can figure out what the traditional size is supposed to be. Although it's high extraction flour, the Golden Buffalo flour is also high protein and would probably make a beautiful loaf for the country loaf version of this recipe. I believe there is high protein white bread flour from Heartland Mill that would fit the "high gluten" character called for. This recipe reminds me of when I was trying to convert the BBA ciabatta recipes with large biga or poolish components to sourdough. This recipe has 76% hydration and 30% fermented flour if I deconstructed it correctly. I had a hard time getting this formula to rise by double, and it would overproof before the dough had a enough gas in it. My solution was to add some yeast to it. 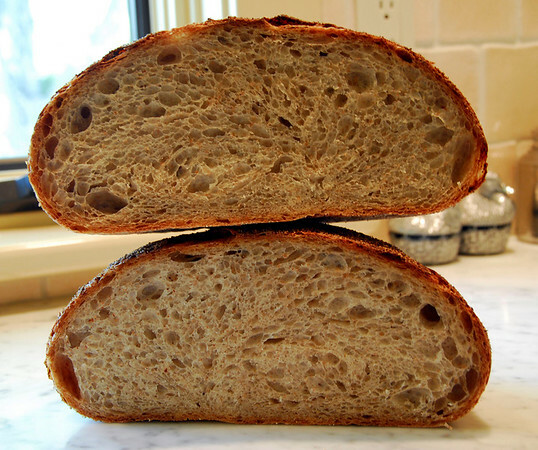 I use a similar formula with a large liquid levain and some yeast in my sourdough focaccias and like the result. If you cut back on the instant yeast, you might want to try also cutting back on the amount of levain and letting it rise a little longer in each phase. I think that would work fine. 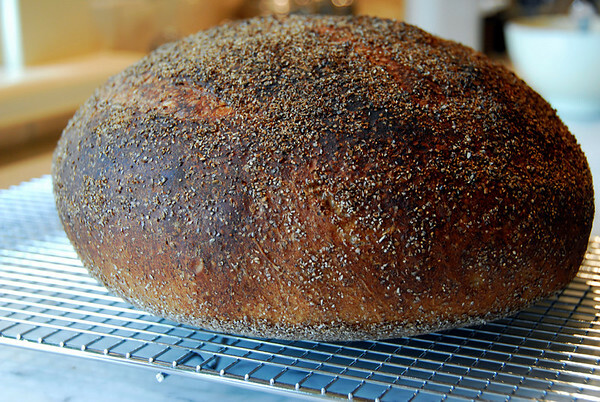 I noticed that Susanfnp in her miche does do something where there is a high inoculation in the final dough, so maybe looking at that recipe will also help if you want to try this recipe without the instant yeast. Thanks, Bill, and I will look forward to hearing about your gigantic country loaf baking in that beautiful new brick oven. It seems a perfect choice for fall baking. I just emailed Wheat Montana inquiring about their protein levels and was told Natural White is 14% which really surprised me. I thought the bag I found at my local market stated all purpose flour. The Sir Lancelot is 14.2% protein level so that is very close. I was surprised at the beautiful color of this bread looking more like a whole wheat instead of white bread. Why is that? 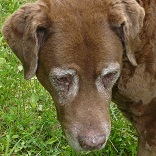 Sir Lancelot sure looks like white flour. I kept checking the recipe to make sure it didn’t have WW added. Is it more like how high extraction works? Oh, dear, I shouldn’t get into this. I have to go back to my books and read again. This can be confusing especially looking at the physical flour and seeing what it produces. Also, I didn't prepare the German rye sourdough starter which was one option for the levain. I just used my normal white starter since he calls for stiff and that is another option for the recipe. I don’t really have a problem with the commercial yeast being added as that must be a necessary part of the recipe. I guess I got indoctrinated by the so-called purist thought that you either make sourdough or you make yeasted bread. But Susanfnp mentioned on another thread how important both can be in certain recipes and a very valid choice. I never add commercial yeast to my sourdough breads but I like to find out why the experts sometimes recommend it. Still, I would like to see how this works with only sourdough…or maybe I’ll let you do that first! Yours is even better looking than the book's. I'm tempted to make it now. What a beauty! I will definitely have to try this one. I also have been enjoying Leader's new book. The recipes are very unusual with breads I have not seen in other books. PS: I also have to add that your photos are always fantastic! Thanks you all. I’d love to hear if anyone else makes this how you like it. Fleur-de-liz, this is such a beautiful book, I agree. It really has some interesting recipes that are very unique. I’m making a triple batch of Pain au Levain today. How do you think that compared to the Pain de Campagne? I will have to make that, too! I haven’t made rye bread yet so would that Polish Cottage Rye be a good one to start with? It looks like a good recipe. ZB: I prefer the Pain de Campagne to the Pain au Levain, although I do really like both. What's nice about the Pain au Levain is that Leader provides several alternate recipes based on the basic formula. I tried the spelt version, which was quite good. For both breads, I do like to retard them overnight to give them a bit more tang, as both are quite mild, in the typical French fashion. I tried the Polish Cottage Rye, my first venture into rye , and it was wonderful. I also used freshly milled rye (from my new Nutrimill) so it was a lot of firsts for me! Because of its lower ratio of rye, I think it's an excellent rye to try first. It also uses only naturally leavening. Fleur-de-liz - Pain de Campagne incredible! Fleur-de-liz, I baked the Pain de Campagne and it was OUTSTANDING! OMG! It was one of the best breads I've baked to date. 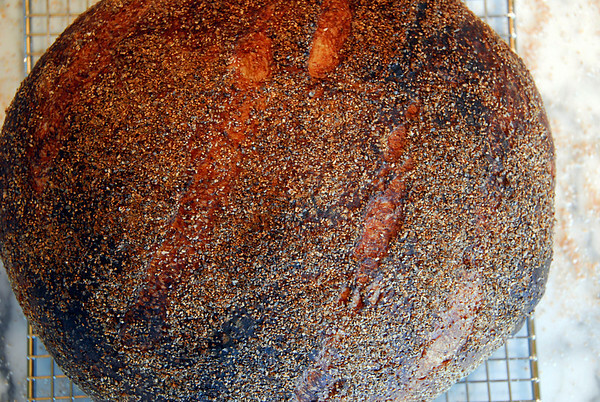 The crust was just the most crunchy, crispy beautiful thing and the crumb was moist and chewy and the overall flavor of this bread was incredible. I am baking it again today and feel it has to become a staple bread. The only thing is that it does seem to take a very long time to rise. I will let it rise today much longer than the recipe states. Did you have that experience, too? Also, I just cannot leave it without doing at least one fold. I'm wondering what you did in that regard as his recipe states to just let it ferment. I mixed up a double batch today and will retard and bake tomorrow so the time doesn't matter. My loaves were quite small too so I'm wondering if I let it rise enough. Today I'm going to make one loaf instead of two per recipe. I just hope I'm doing it right but no matter this is sensational tasting bread. I am very interested in milling grain too and plan to get the attachment to my new DLX. That's a whole new subject but I'd really like to try it. I'm sure the Pain de Campagne you made was beautiful and I hope we get to see photos of it and the one you're working on now. Your photos are such an inspiration even though I'm getting way behind keeping up trying the recipes. Fleur-de-liz - I loved the Pain au Levain. I was really happy because Leader says he has taken years to perfect this recipe and even though his description was regarding a special “type 70” flour (germ and bran-flecked) he said comes from white winter wheat that is sweeter I thought this was a good candidate for the whole wheat graham flour I like to add to white breads since it is so distinctly sweet compared to traditional WW flour. I think it also has a lower protein level which he mentions is important here as well. It was a delicious bread and wonderful toasted. I’m baking the Pain de Campagne today so I can’t wait to taste that. Thanks for the heads up on that one. Thanks for the compliments too but I promise you I am always surprised when my bread comes out well. They don’t all, you know. :o) It is a never ending labor of love though and no matter what loaves do come out well I always think they can be improved. Weavershouse – I did use my KA mixer and beat the heck out of that dough on speed 10 as he calls for. I didn’t realize that you are not supposed to mix that high or for that long on a KA mixer especially my less powerful Artisan 5. Just after I made the Genzano I drove out to Pleasant Hill Grains and bought an Electrolux DLX mixer and I’m really enjoying the difference it has made in mixing dough. I did really love my beautiful purple (hehe) KA but honestly there is no comparison in ease of use and capability. As for mixing my hand, I’m the wrong one to ask. I’m a weakling who has a hard time mixing by hand initially for autolyse. :o) If you are an experienced hand mixer of dough you may be able to do this one although he doesn’t give instructions to mix this recipe by hand. Bill just made this bread in super sized humongous loaves and he might be able to address that since he now sees the process, the dough consistency, and he loves to mix his bread by hand. 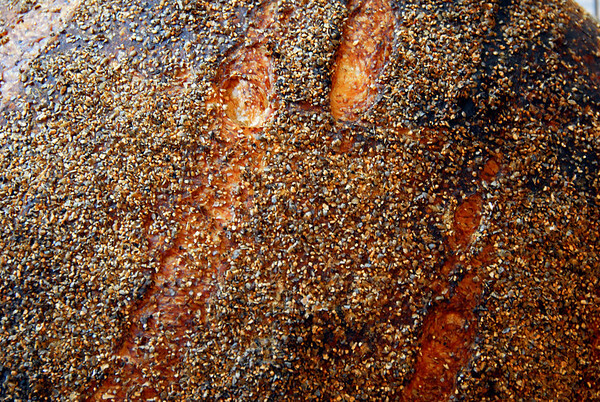 You mention a germ and bran flecked white winter wheat flour, and I would suggest you check Homestead Grist Mill. They have a product they call "Sifted White Wheat" flour that I think would come pretty close to what you describe above both in protein level and the fact it is high extraction. Although the Genzano loaves are mixed aggressively by machine according to Leader, I think you could make a very close approximation to this bread by making the "Sourdough Pagnotta" recipe in my blog raised in a couche lined banneton dusted with lots of bran and could certainly be kneaded by hand. Although you could just knead the livin' daylights out of it initially by hand and be done with it, my tendency would be to spread the gluten development out by an initial autolyse, then kneading using the wet handed techniques mentioned by Glezer in Artisan Baking, by working up and down the dough squeezing and extruding the dough through your fingers alternated with "french folds" and a minute rest to let the gluten relax and clean and rewet hands, for 20-30 minutes, and then doing some stretch and folds every 30-40 minutes after that. I'm sure it would work, as I've done essentially that process many times. I don't know if you could get the loaves quite as high and light as they came out using the mixer, but the results should be good by hand. By the way, I liked the result I got for the Genzano loaves by reducing the inoculation to 20% fermented flour and reducing the instant yeast to .25%, which allowed for a bulk fermentation of about 3.5 hours and a final proof of about 2.5 hours, which allows the sourdough flavor to develop a little more. For the high gluten flour in the Genzano I do have to say that was very silky dough and easy to mix or I doubt my mixer could have stood up to it. Poor thing, I've really put it through a lot. Anyway, that dough was so springy and I’ve been having fun experimenting with the Sir Lancelot but I sure didn’t care for it at 100% in the American Pie, Neo-Neapolitan pizza dough. Much better, to me, to use KA bread flour. It really amazes me how the same flour can react so very differently in another recipe so I guess I should not completely shun the Homestead white wheat idea. It is just that I’ve found a flour that is one I’ll never be without and something else in its place would be very hard to beat it. Oh, and Leader never asked for white wheat flour in his recipe which kind of struck me odd after the fact but I suppose it is the mix of flours that is coming close to the type 70 European flour and not so much that you need to use white wheat. Extraction rate has to do with how refined the flour is, rather than the protein level. So, you could make a high extraction flour from wheat with high or low protein levels. The extraction rate can be thought of as telling you what percentage of the kernel from the inside to the outside is in the flour. The outer shell of bran is about 15% of the kernel, and the germ is another 3% or so. The first 72% from the inside of the kernel is the inner part of the endosperm and creates regular white flour. So, an extraction rate of 72% or less should be a normal white flour. An extraction rate of 86% or more should have all the germ and some bran in it as you go higher. An extraction of rate in between 72% and 86% is in the general range for a flour that would have some germ and bran flecks in it, as well as the components coming from the outside of the endosperm that are where first clear flour and second clear flour come from. The thing that is a little confusing to me about Leader's comment and also the one about "type 85" flour in the Pane lariano di Genzano discussion, is that those flours are listed as typical type numbers of rye flour when I look them up in Calvel's book in the section about French flours. In any event, type 70 should coincide roughly with ash content around .7 and an extraction rate of around 80%, which would probably have a certain amount of germ and bran flecks in it and a slightly off-white color from the components in the outer endosperm. Now that I read the discussion in Leader's book, the Homestead Mill "Sifted White Wheat Flour" is probably at a higher extraction rate around 85% to 90%. Also, I checked and it is hard white spring wheat, so it probably has a fairly high protein level but not as high as Prairie Gold because the wheat is from further south. I think you could think of the Homestead Grist Mill sifted flours as something like a slightly lower protein, slightly higher extraction version of Golden Buffalo flour. The white wheat should have a sweeter flavor than the red wheat flour product. You could probably blend the sifted white wheat flour with an AP or bread flour at about 50/50 and get an approximation of the type 70 flour. Another way to simulate the type 70 flour might be to use a 80/20 blend of something like Heartland Mill UBAP flour with Heartland Mill Strong Bread Flour mixed with a few percent first clear flour, 1% wheat germ, and about 5-10% prairie gold or other white wheat flour. The reason that would be closer than just adding together bread flour with a small percent of whole wheat is that high extraction flours have more of the germ and the clear flours in them than a mix of white flour and a small percent of whole wheat. I say that a lot, huh! But thanks for taking the time to explain that so well. It is keeper info for me to refer to when I forget, which seems to be often. Thanks for the info. I don't have a mixer but always thought if I bought one it would be the DLX. The Kitchen Aid always looked like it would be too hard to add ingredients. Even on the food shows I saw the cooks spill things trying to add ingredients. Especially flour. Anyway, I'll have to think about this recipe. Your photos are so beautiful I want to try it right now!! Thanks Bill for your input. It's funny you mention the sourdough pagnotta because that's just what I made yesterday. Two batches. One I let sit overnight in a cold room before shaping and baking. It had a real tang to it. The other I started in the morning with cold starter from the fridge and was able to bake them off by 4:30 p.m. They all rose beautifully and had great flavor. I preferred the less tang of the batch made in one day. I made each batch into two loaves. Great recipe. I may have to be satisfied with the pagnotta and not try the Genzano. Or I might try it like you mentioned in your post. I'm sure I'd just do stretch and folds, no kneading. I'm not strong enough for all that kneading. Zolablue: So glad to hear that you enjoyed Leader's Pain de Campagne. I, too, think it is an outstanding bread. In making this recipe I realized that I had been previously underkneading my loaves, so I found Leader's technique quite instructive. I have made this recipe twice, I believe. I am not recalling needing extra time for rising, but I baked these late in summer when my kitchen was quite warm. I did retard in the refrigerator as I like the enhanced flavor. I will try to make it again now that the weather is cooler and see if I need to proof longer, and let you know. I added a bit more salt and also doubled the recipe, as you did. How are you enjoying working with your DLX? It certainly handles more dough and is far more gentle than the KA. The one bit of advice that I learned way too late is to add the flour slowly while mixing. Hope this helps you earlier in the process. Am just getting into milling my own grains. The rye that I used for Leader's Polish Country Rye (another really good recipe) came out wonderfully. I coarsely milled some wheat (red winter wheat) this weekend and sifted it to remove the bran. I thought the wheat tasted kind of "grassy", and was not thrilled with the taste. I just ordered some 5 lb. bags of different wheats from Wheat Montana to experiment with. I like the idea that the grains can be stored for longer periods of time and that you grind them to use as needed. I have read conflicting things about the freshness factor and am wondering if my wheat this weekend needed some aging time. 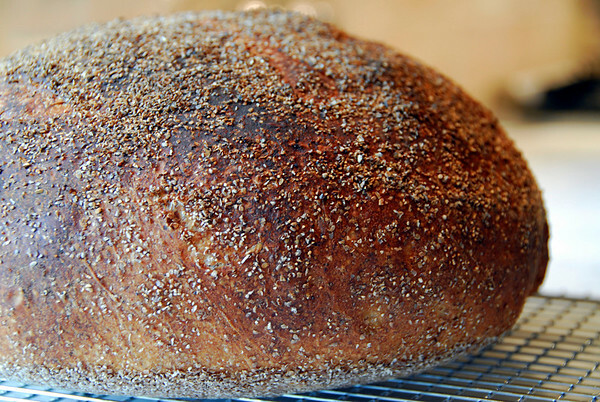 Incidentally, I baked Glezer's Semolina Sourdough this weekend, and it was sensational. I think I may have added too much water, which, while it made it difficult to handle, produced a wonderful ciabatta-like bread. I love the slightly sweet, nutty taste of finely milled semolina flour, don't you? Am anxious to try some of Leader's semolina breads.